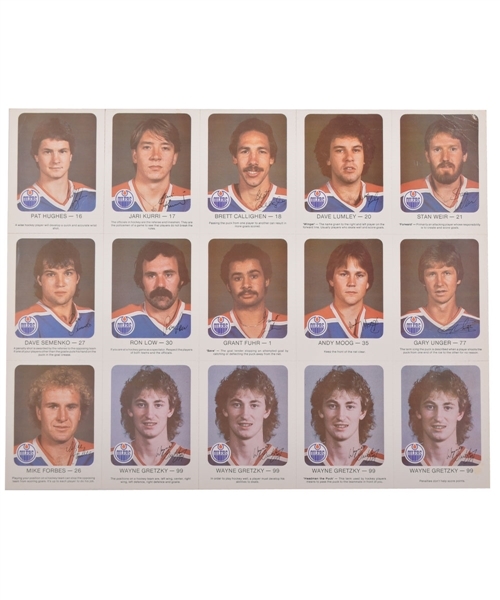 Cool find is an uncut sheet of Edmonton Oilers 1981-82 Red Rooster cards featuring four of the rare Wayne Gretzky “long hair” cards. This sheet of 15 cards with the factory perforation lines mostly intact and the cards together as one complete sheet measures approximately 13 3/4" x 10 3/4" and features fellow HOFers Fuhr and Kurri among the 11 other Oilers pictured. 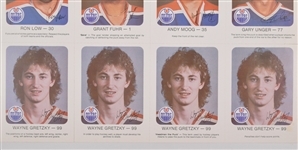 Best of course are the four rare Gretzky "Long Hair" cards, an image Wayne reportedly disapproved of and which prompted a second printing of "Red Rooster" cards in 1981-82. 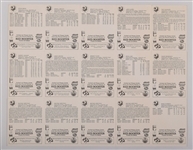 The bottom right Gretzky card has a small fold in the top right corner and crease and light yellow stain in the bottom right corner. The top edge perforation between the bottom right Gretzky card and the Unger card above it have become partially detached. The perforation between the first and second Gretzky card on the left has detached. 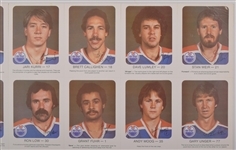 The Hughes card in the upper left is barely attached by its bottom right corner to the and Semenko card below and the Kurri card to its right. The Weir card in the upper right corner displays creases, and there are light creases to the top edge of the Kurri and Hughes cards. Also included are Moog, Lumley, Callighen, Low and Forbes cards.